Millennials lag behind older generations in their interest in government and politics. When asked to choose among a list of nine topics, only about a quarter (26%) of Millennials name government and politics as one of the three topics they are most interested in. By comparison, politics ranks among the top three interests for roughly a third (34%) of Gen Xers and 45% of Baby Boomers. 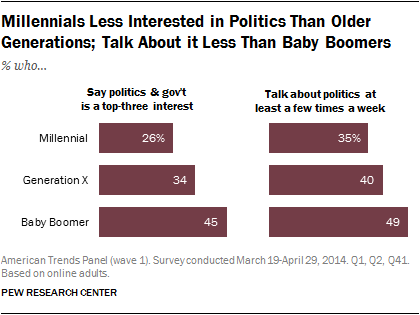 Millennials also talk about politics less frequently than Baby Boomers; while about half (49%) of Baby Boomers say they talk about politics at least a few times a week, just 35% of Millennials say this. This lower interest in news among young adults is not unique to Millennials. For decades, 18 to 29-year-olds (who currently make up a majority of Millennials) have expressed less interest in politics and political news. Young adults consistently have followed news about political figures and events in Washington at lower rates than any other age group. 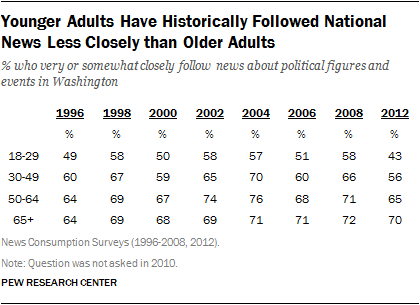 For example, 18- to 29-year-olds in 1996 (then Gen Xers), were substantially less likely than older adults to say they followed news about political figures and events in Washington. This survey of online adults finds Millennials are also less aware of many news sources than are older generations. Of 36 sources asked about Millennials have heard of 18 at substantively lower rates than both Gen Xers and Baby Boomers. 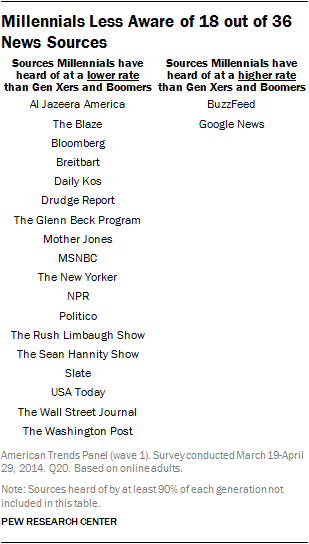 These sources include three major newspapers (USA Today, The Washington Post, The Wall Street Journal), four radio programs and networks (NPR, The Rush Limbaugh Show, The Glenn Beck Program, The Sean Hannity Show), economic sources (Bloomberg) and sources whose audiences tend to lean to one side of the ideological spectrum (Drudge Report, Breitbart, Slate, The New Yorker). There are two sources where Millennials display higher levels of awareness – Google News and BuzzFeed, two digital-only news sources. For the portion of each generation that has heard of each of the 36 sources, visit the sortable table interactive.